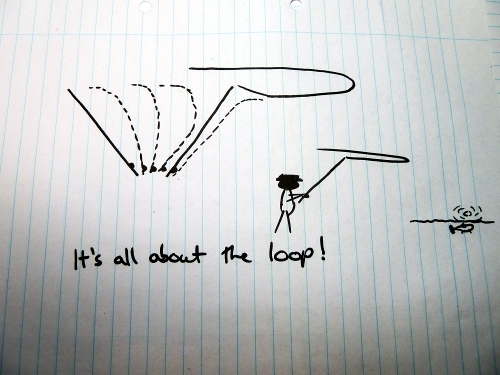 The loop is something that has captured the imagination of many, for some it is a by product of the effort to get your flies to the fish, there’s not much thought about it, it is just part of the process; for some it is the focus of everything, a good loop is the key to good casting and attempting to master control of it is what keeps many of us searching and learning as full control is but an ideal but we can always improve; some even see it as an art form, you’ve no doubt seen many lovely pictures and cinematic shots of unrolling loops. Whatever you see it as, it’s the very thing that lets us enjoy the strange pursuit of casting flies at fish using a long length of flexible plastic – sounds crazy doesn’t it?! It might sound crazy when it’s put like that but as we all know; it’s not crazy, it’s just fun! 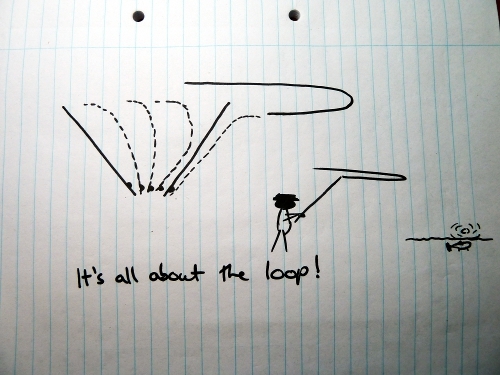 In the interests of completeness and so that my very simple doodle isn’t taken the wrong way, here’s some links to Jason Borger’s writings which have fantastic explanations, videos and full data to wade through if you are technically minded or have a real interest in casting mechanics. If you’d like some help with making loops like the wee cartoon man casting at the fish then get in touch and we can organise a lesson! Bookings are starting to get pretty full up this month but there are still some dates available. Check out SL Fly Fishing more information and my contact details.